During the first decade of the twentieth century she illustrated a number of books for George Bell and Sons, including George Sand’s La Mare au Diable and François le Champi in 1908, and Daniel Defoe’s Robinson Crusoe in 1909. Her name is credited in substantial type on the covers and title pages of these books, and each includes a generous mix of black-and-white line illustrations and coloured plates. She had studied with Max Bohm (1868-1923) at the international art colony in the fishing port of Etaples, and her work was shown at the ‘Salon des Artistes Français’ in Paris in 1902. 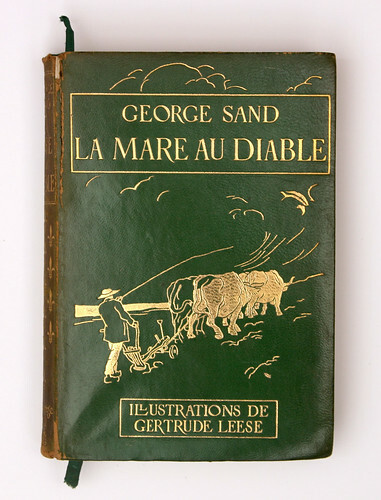 Cover for George Sand’s La Mare au Diable, with illustrations by Gertrude Leese, 1908. Top: From Gertrude Leese’s five sketches titled Camp Life at Étaples showing a column of British soldiers march from right to left; behind are tents and a flat landscape, 1917. 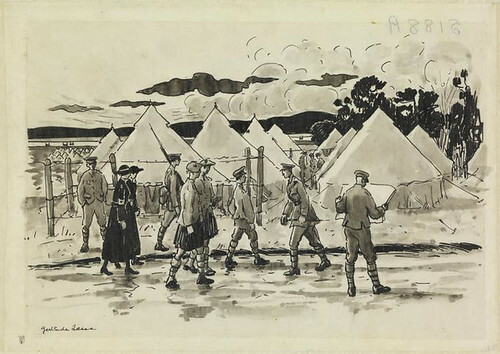 All sketches from Leese’s Camp Life at Étaples are from the Imperial War Museum collection. © The Artist’s Estate. 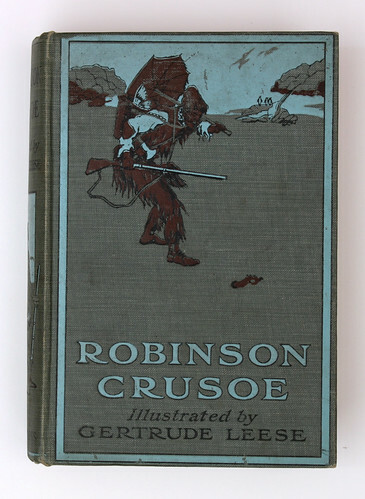 Cover for Daniel Defoe’s Robinson Crusoe illustrated by Gertrude Leese, 1909. During the First World War, Leese volunteered in the Voluntary Aid Detachment (VAD) at Etaples, in an Allied military camp that had many hospitals on site. The Imperial War Museum holds five sketches Leese made while there, which she donated to the museum in 1954. These delicate, dynamic ink-on-paper illustrations give us a glimpse into life on a busy wartime base. The first sketch of the five depicts a group of soldiers walking along a road in front of a tented encampment. The sky is turbulent and the ground appears wet. One soldier is checking a map, another stands with his hands in his pockets, while a third strides purposefully off in the opposite direction to the others. Other figures, including two kilted Scottish soldiers and two women from the VAD, can also be seen. The scene is full of movement and energy, yet is not at all fraught. Gertrude Leese, undated, 1916-17. A view of various military personnel on a road or path in front of a an encampment of tents; including two women in Voluntary Aid Detachment uniforms, two Scottish soldiers in kilted uniforms, an officer with a stick, a soldier examining a map, and a sentry. © The Artist’s Estate. The second sketch, from 1916, is of a crowded interior. It represents a canteen with a large gathering of soldiers inside. The room is already full, yet more soldiers are arriving through the door. In the foreground are three other soldiers standing in a relaxed pose, with their hands on their hips or in their pockets, talking quietly together. Behind and around are other men sitting down to eat their food, reading newspapers and magazines, or chatting animatedly at a table. Little details make this scene feel very real, such as the empty bowls scattered on the floor, the pictures pinned on the wall, a soldier sitting with his leg stretched out in front of him as if his foot were giving him gyp, and a group of others squashed uncomfortably on a bench alongside him. Gertrude Leese, 1916. 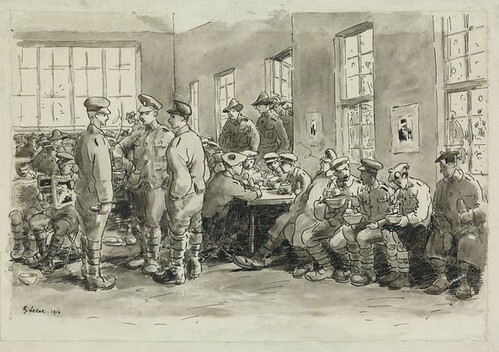 A crowded scene in the canteen of a military camp; three soldiers stand conversing in the foreground, while many others sit eating at tables and benches, reading, or are entering the hut. © The Artist’s Estate. 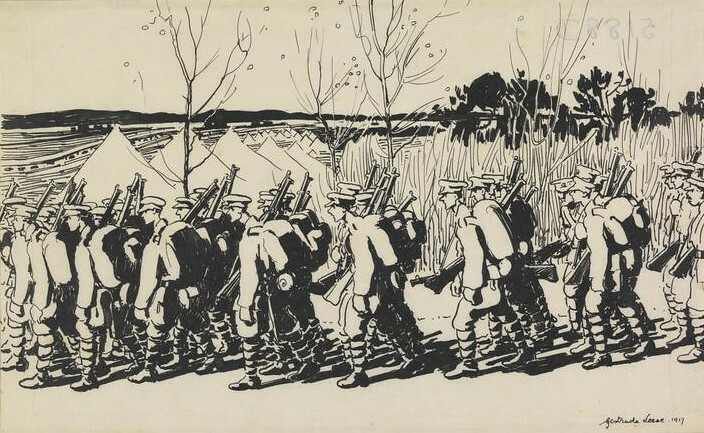 The remaining three sketches are more obviously war-like, showing columns of soldiers tramping along French roads. One view, from 1917, is seen side-on, with British soldiers marching with their heads leaning forward, rifles over their right shoulders and heavy rucksacks on their backs. The strong black-and-white contrast in this image makes it particularly powerful and calls to mind C.R.W. Nevinson’s darker 1916 image Returning To The Trenches (see ‘Futurist At The Front’ on the Eye blog). The final couple of images show columns of soldiers face-on, led by military musicians, the first by Australian brass players, the second by Scottish bagpipers. These last two images are enlivened by a touch of humour through the addition of various civilian bystanders. In one illustration a pair of women lean across to sell fruit, with a man urgently calling them back on the far right; in the other, two children on the pavement and a girl leaning out of a window are ogling the sight of so many kilted men on parade. Gertrude Leese, undated, 1916-17. 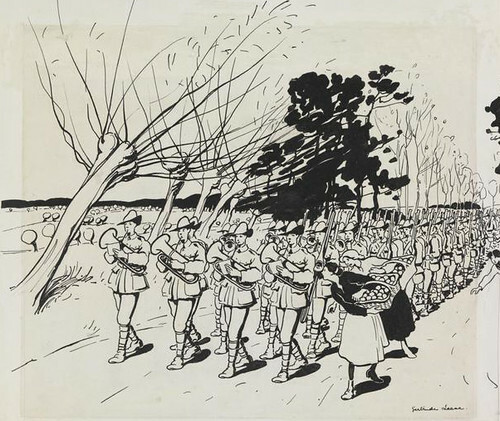 A column of Australian soldiers march four abreast, led by a brass band, along a tree-lined road in the French countryside. Two local women with baskets of fruit walk alongside the head of the column, attempting to sell their produce. © The Artist’s Estate. Gertrude Leese, undated, 1916-17. 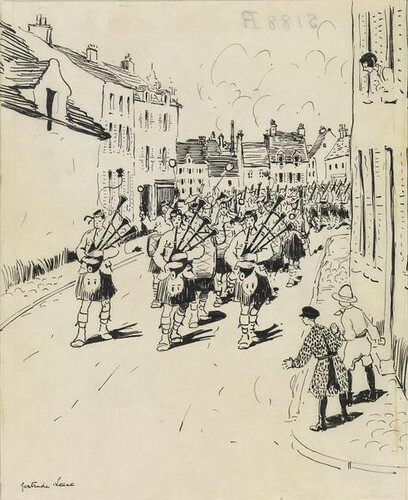 A column of Scottish soldiers with kilted uniforms and bagpipes parade through a town. A young woman watches from a high window, and a young boy and girl stand watching on the pavement. © The Artist’s Estate. Leese was friends with many artists of the time, including Wyndham Lewis (1882-1957), co-founder of the Vorticist movement, and Helen Saunders (1885-1963) and Jessica Dismorr (1885-1939). Along with Lewis and others, Saunders and Dismorr both signed the original Vorticist manifesto in 1914 and they are depicted in William Roberts’ 1961 painting, held in the Tate, The Vorticists at the Restaurant de la Tour Eiffel: Spring 1915 (the restaurant was in Percy Street, London). Leese was also close friends with her second cousin, Catherina Dawson Giles (1878-1955), known as Kathie, another painter who knew this group. In 1924 Leese, then in her fifties, studied at the Académie de la Palette in Paris, where Dismorr had studied earlier in 1910-13. Subsequently she sketched and painted many other European scenes, including a number of the French Riviera and the Mediterranean. But it is the immediacy of these simple wartime sketches that are particularly poignant, as they are such a clear and vivid reminder of the people involved in that challenging and harrowing time of more than 100 years ago. 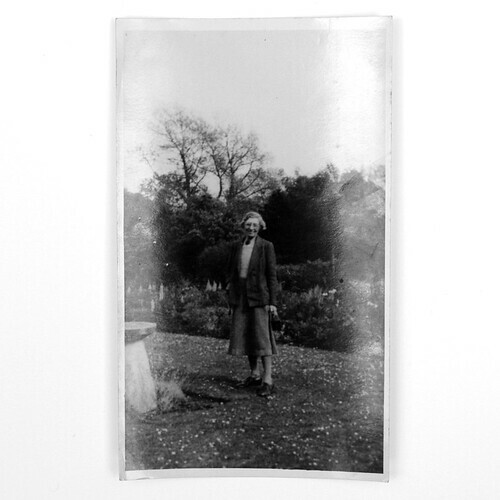 Photo of Gertrude Leese, aged 76, from May 1946 in Alfriston, East Sussex, where she lived from 1926 until her death in 1963. If you have further information about the life and work of Gertrude Leese, please contact the editor at Eye magazine.